Audiences everywhere are living in a golden age for superhero and comic book entertainment, largely due to two companies. However, while one company has seemingly taken over the world by turning their less popular characters into billion dollar franchises, the other struggles to successfully translate their icons into entertaining films. And even though Marvel continues to succeed time in and time out, Aquaman feels as though DC may have finally turned the corner. Once home to the most advanced civilization on Earth, the city of Atlantis is now an underwater kingdom ruled by the power-hungry King Orm (Patrick Wilson). With a vast army at his disposal, Orm plans to conquer the remaining oceanic people -- and then the surface world. Standing in his way is Aquaman (Jason Momoa), Orm’s half-human, half-Atlantean brother and true heir to the throne. With help from royal counselor Vulko (Willem Dafoe), Aquaman must retrieve the legendary Trident of Atlan and embrace his destiny as protector of the deep. The story for Aquaman does the character absolutely no favors in the reputation department. 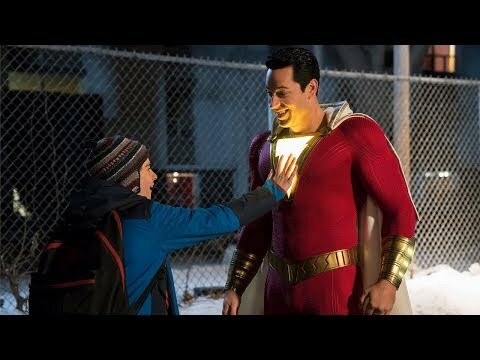 Bloated and nonsensical at times, the plot for the film aims for an epic liken to some of the other big comic book films of the past ten years, but ultimately falls short of its larger aspirations. Fortunately, the overtly and deliberately cheesy tone marks it as a film that knows exactly what it is at its core, even if that’s a fairly unoriginal effort, at least where the script is concerned. Where Aquaman is salvaged, and even excellent in moments, is within the more technical elements. The filmmakers visual imagination has clearly run wild in building the world of Atlantis and its various kingdoms from the ground up. Yet it doesn’t end there, as the third act finale features some of the strangest visuals seen on the silver screen in a while. Where else can you go to see Atlanteans riding sharks with lasers attached to their (freaking) heads? Or Patrick Wilson storming into battle on the back of a large prehistoric sea creature? It’s completely insane, and does nothing but benefit the pure fun that can be had with the film. Without a cast as good as this, none of the technical elements would even be a factor to the films quality. An argument could be made that Momoa’s charisma and inherent look of heroism and strength draws the audience in, and though his performance is good, the supporting pieces are far more vital to selling the film. For one, Patrick Wilson as Orm is fascinating. His desire for power and blood is nothing new for a comic book villain, but Wilson is given so much dialogue to chew on, with some lines cornier than others, and he is clearly enjoying every moment of it. Amber Heard as Mera and Willem Dafoe as Vulko both give fairly good performances and both play their part in shaping the hero’s journey, even if they aren’t given too much outside of pushing Arthur Curry in the right direction. 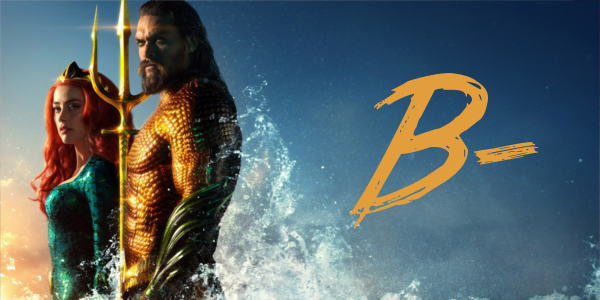 Aquaman is not without issues, most of which can be traced to the lackluster script, but the sum of its parts results in a win for Warner Brothers and DC overall. Aquaman functions as a solid foundation for a franchise with endless potential, much in the same way that Thor did back in 2011 for rival company Marvel, with plenty of mythology to explore and fun characters to revisit. If this was the introduction of Aquaman and his world to the general audience, there is no guessing how truly wild and weird the filmmakers can go from here.